This summer’s ordeal with Clarke’s eye injury was interesting for many reasons. Clarke’s amazing display of maturity in the face of uncertainty and discomfort was one reason. All of the waiting, shuffling and shuttling from the Urgent Care center, to the Emergency Room, to the Pediatric ward for subsequent exams, was another. When all was said and done, Clarke had endured more than any parent would want their child to experience including a CAT scan and a visit to the Ophthalmologist for a final opinion. A few thousand dollars and day-and-a-half later, Clarke was on the mend, all thanks be to God, and I began to observe and reflect. For me, hospitals have always been interesting places. I remember accompanying my father when he would visit sick family members, parishioners, folk he knew from the neighborhood or elsewhere in the community he happened to hear were sick; fellow clergyman, political constituents and the like. There were even occasions when people who had no known church affiliation would holler out into the hallway and ask if he would come and pray with them. As an older teen, I was Dad’s chauffeur and personal assistant; his “body man”, if you will. But when I was a young tyke, I would sit in the designated waiting area and if it wasn’t a terribly busy time, I would be entertained in fits and snatches by members of the nursing staff. To me, the hospital was the equalizer. Unlike churches, hospitals weren’t among the most segregated places in a city at that time. And, if truth be told, I would say there was more fervent prayer in the hospital, on any day, than in many a church … even on Easter Sunday. The hospital was that place where people of all colors, creeds and religions would go seeking a remedy for whatever ailed them. Some would pray to God while others, who never prayed before, would pray hoping there was one. Whether they were sick or recuperating, in some emergent need or undergoing a battery of tests to keep tabs on those pesky symptoms, the hospital was either the first line of defense or the last stand for people of every background. The circle of life, with its perfect rhythm and syncopated beats, both began and ended here. And no matter which, families were forever changed. As Clarke and I moved from station to station I remembered my younger years moving through hospitals with my father. While I was just as quiet and observant now as I was back then, I was also much more aware; though I was still an emotional magnet. The discomfort of those being wheeled from room to room; the moans of those being carted in and out of the elevators … it was all so palpable. For this reason, each time I cross a hospital’s threshold I work at making it my practice to utter a silent prayer for all who find themselves in the hospital; the patients, the doctors, the caretakers and the family members of each patient. 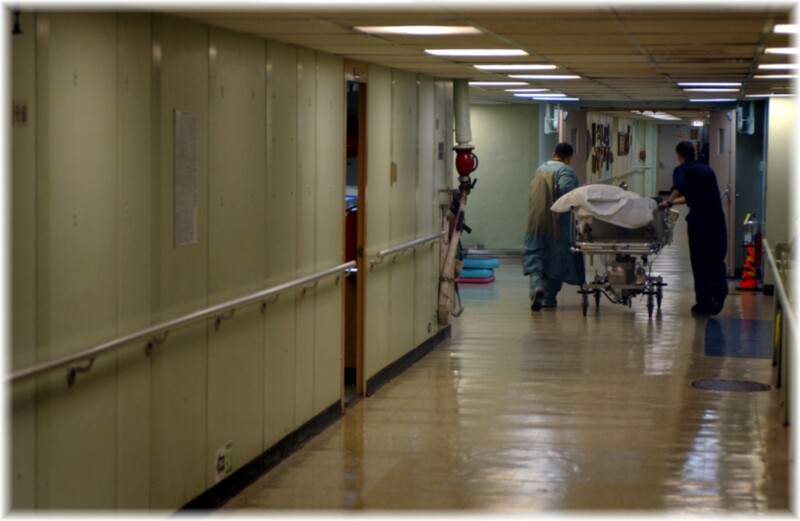 No matter the reason, every patient, every family, every life is being altered in some way in a hospital. God is working overtime in a hospital. True, God always works overtime but it is so much easier to see – should you ever take time to notice – in the halls of the hospital. By God’s Grace, I was afforded the comfort of knowing that Clarke would be ok. Her injuries were nowhere near life threatening or even life altering beyond her time of recuperation. But I never lost sight of the fact that there were those I “met” spiritually that day – if only in the brief moment our eyes locked – whose lives would, indeed, be altered. As I was finishing this piece I learned of an old friend, Levonne Garvin, who was the passenger in a tragic motorcycle accident. According to news reports, a crossover vehicle crossed over the double yellow lines, struck the motorcycle head on and both vehicles burst into flames. Levonne was flown by helicopter to a shock trauma hospital where she later died. She was just 50 years old. She was a mother and she was a friend to many. I thank God for our paths having crossed and her wonderfully vibrant spirit and zest for life. So I ask that we all remember life is just as fragile as it is precious. It can be altered (for better or worse) or ended in the blink of an eye. Transitions are happening as you read this … on roads, in homes or on battlefields in foreign lands. And yes, even in hospitals. Some too soon, and yet, others not soon enough when we think of those enduring great pain and discomfort. I am grateful to God that Clarke will be ok; I can only hope that God’s Angels snatched Levonne’s soul to Heaven before she knew any pain. I pray God continues to watch over and comfort those with sorrowed eyes – like those that locked with mine – as I moved through the halls of the hospital. I am glad Clarke will have only memories of an anxious time and no lasting negative impact. This is such a moving “piece” I will have a different perspective of “life” in a hospital whenever I enter again. I worked as Chief of Laboratories, Blood Bank and Serology for 13 years , was always emphatic toward patients and families, but never this depth of thinking about their plight. There were many nights and days when I was frantically looking for blood for patients who were victims of tragic accidents, scheduled for surgery or needed transfusions for other life saving treatments, but I never looked into their lives in this way. I am sure as I reflect on those times it was for “the good” each patient had a critical need for care but at the moment I didn’t have the luxury of this kind of emotionalism– needed a clear head and a certain amount of decisiveness (smile). Say hello to your family.Looking forward to seeing you all soon. I know I couldn’t work in a hospital … at least not for very long. I have such respect for those (like you)who do (or did) and thank God for them (you). My empathy/sympathy would prove to be kin to a curse for me because I tend to become too attached. Successful hospital folk have to be able to detach long enough to get the job done and get it done right … especially in the PICU unit! This was a welcome surprise! I know it was days ago…darn near a year ago, so I apologize for the tardiness of this reply. I write without thinking anyone will take the time to reply so I just write down, get it out and move on. Today is the first time in a long time I have been able to be still and quiet … And not fall asleep (smile). Thanks so much for taking the time to reply, it’s one thing to think you have connected with someone else it’s quite another to be assured … I must admit, it feels good! Now if I could only get this book out! Robyn finds her way into my prayers often. I know she has been struggling but has been doing so with such grace. She has words of encouragement for others who never know her struggle. Tell her I love her, as I do you all.